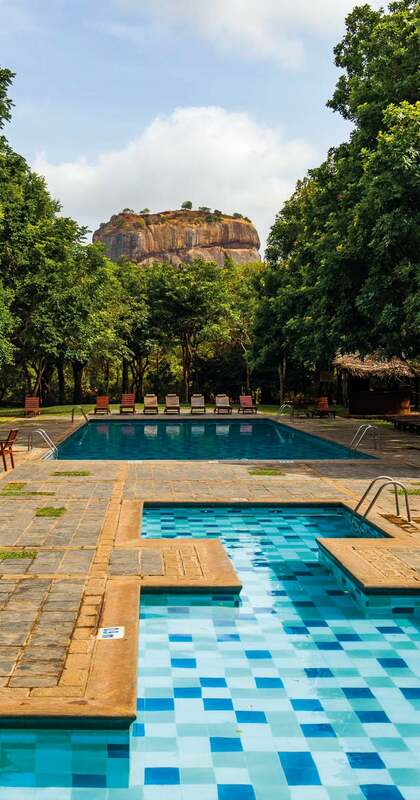 It started with one hotel, surrounded by dense trees and a swimming pool looking straight out on to Sigiriya rock. 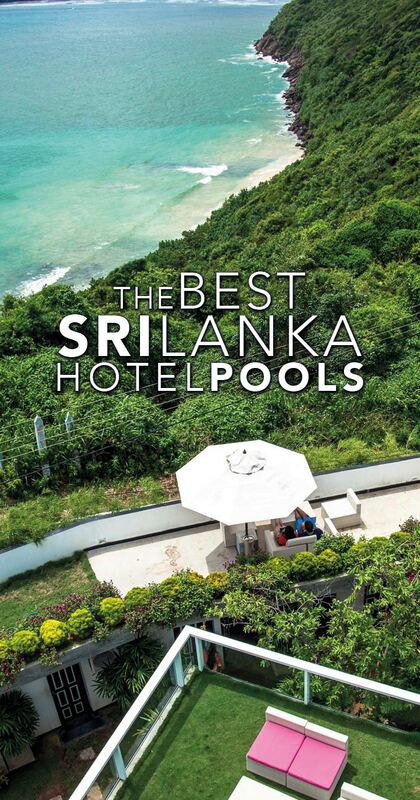 As I delved through the hundreds of hotels in Sri Lanka I started finding more and more with incredible swimming pools. 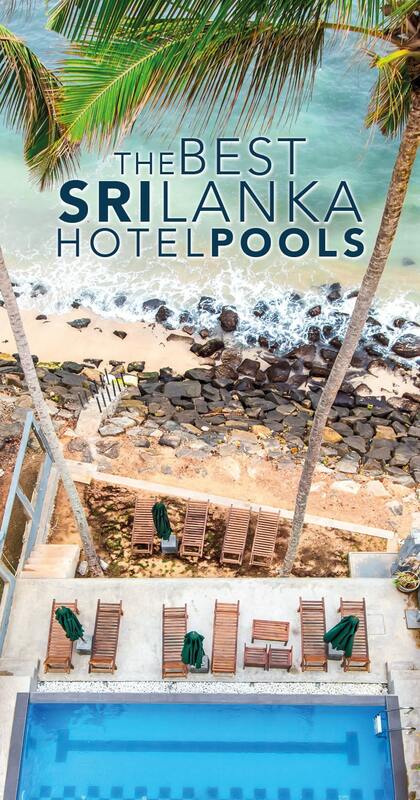 From infinity pools to those on a mountain surrounded by tea fields, it became a mission to find as many awesome pool hotels in Sri Lanka as possible. This could be one of my favourite hotels of all time. It’s small with a range of boutique rooms all with sea views. 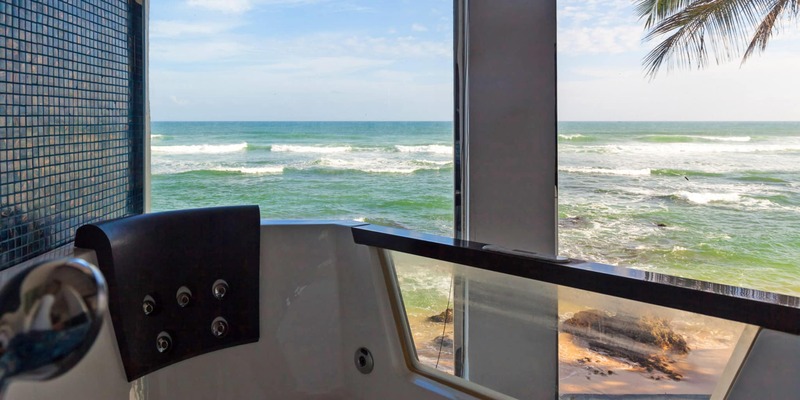 The executive rooms have baths looking out on the ocean, as above, and the infinity pool is a winner sitting right on the water front with a vast expanse of beach to one side which was near empty the whole time I was there. 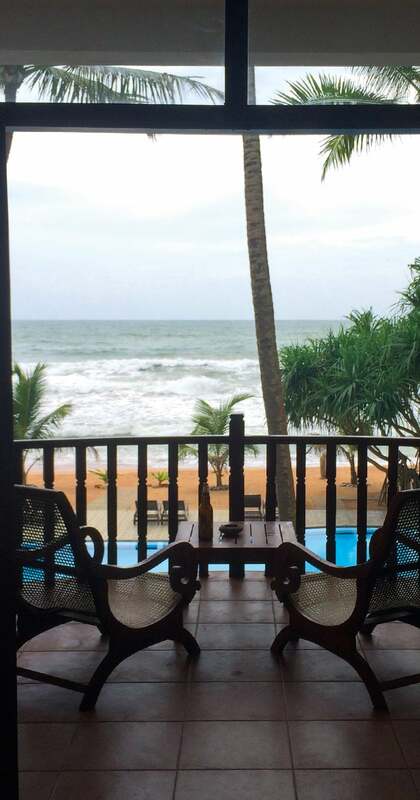 It’s a little bit away from everything else, which isn’t a bad thing (a 2km walk from the nearest train station) or a rickshaw drive to Unawatuna but with a restaurant onsite, seriously chilled vibes and super friendly staff it’s a great place to switch off for a few days. Luckily, this is the dolphin free kind of Sea World. I nearly didn’t stay here as the photos on the website don’t do this property justice. It is a ’boutique hotel’ apparently though, I’m not sure I would class it as that. 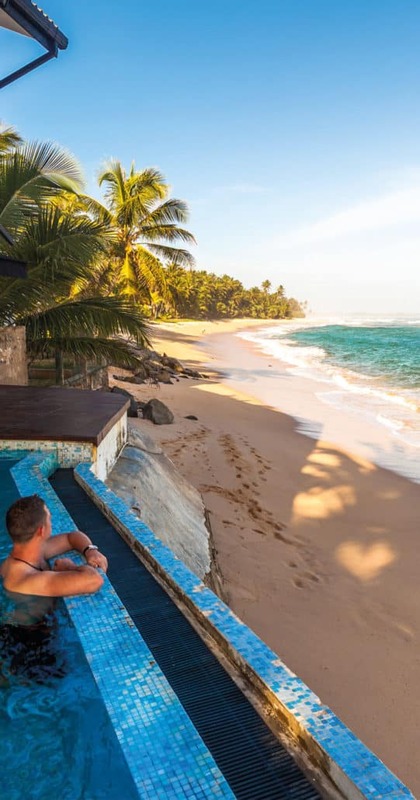 Mirissa is another realitvely sleepy stop off and it’s between here and Antaloupe Aqua the famous stilt fishermen of Sri Lanka can be found. 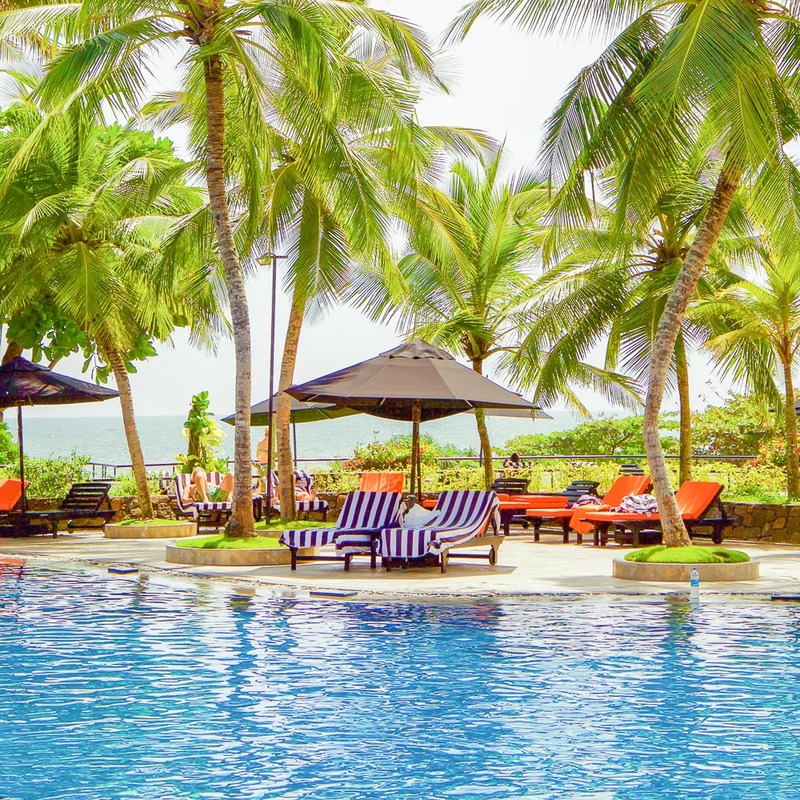 The staff are cheery if a little relaxed and the breakfast standard but the quaint rooms and most importantly, the pool with steps to the ocean was what had me booking. Eating breakfast, feet hanging in the pool and looking out on the waves is a pretty sweet way to start the day. Along this strip of coast on the west sits a handful of resorts which for some reason were surprisingly expensive compared to much of Sri Lanka which is why I found myself checking in to Whispering Palms. The view from the room balcony looks just as above and with the pool basically set in the beach you couldn’t get much closer if you tried. The hotel has a very open plan feeling too it, including a big area canopy restaurant and bar over two floors – which sucked a little when the storm came in just after this photo. They also had Cards against Humanity behind the bar which was a pretty random way to pass a storm with a bunch of hotel guest strangers. The sister property of Aqua above, set up on a hill looking out to Galle on one side and Unawatuna on the other, I didn’t actually stay here but was taken for lunch and a tour by the owner from the group after mentioning I was heading to Galle. 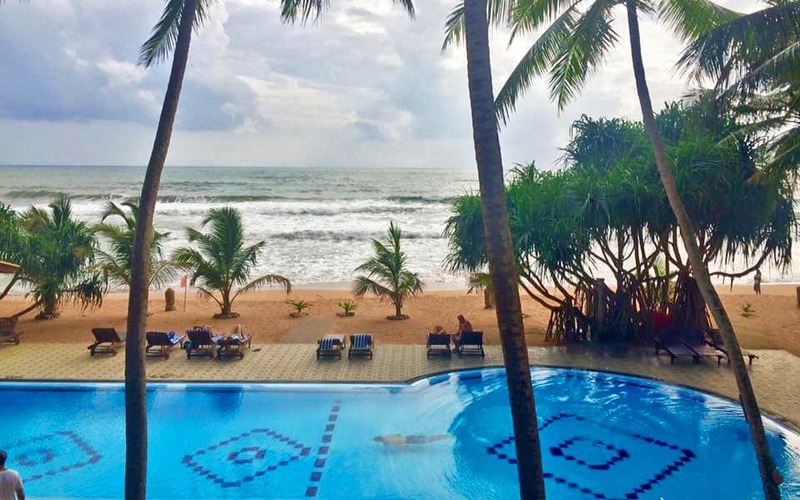 The executive suite has incredible fully frontal windows looking across the ocean at Galle and the view from the pool with its double beds surrounding it ain’t half bad. You are super close to jungle beach here but watch out for snakes on the walk down. Taj are an upscale hotel chain which have hotels around the world. 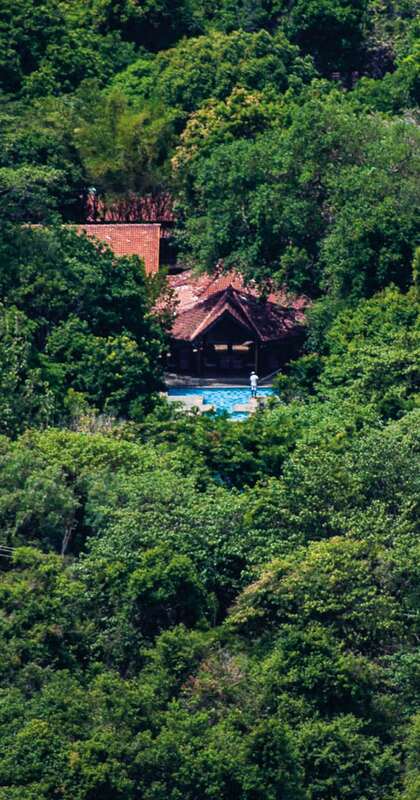 This Instagram shot does not do any justice, if you were to zoom out you would see the whole resort and pool sit on a cliff with crashing waves and a private beach just below. 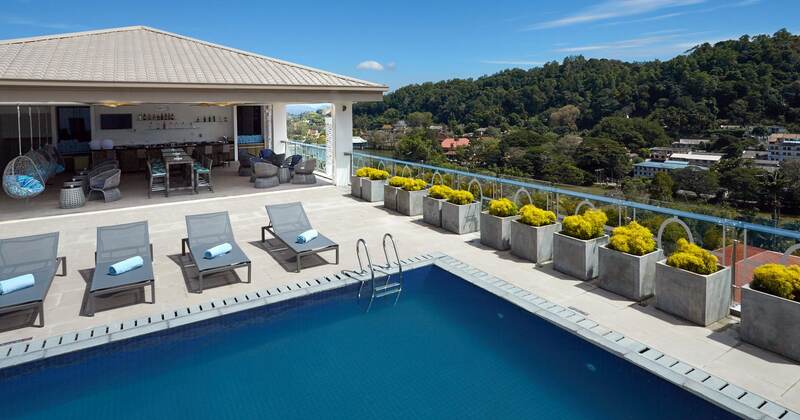 It’s one of the more expensive hotels along the coast but there is a bit more to do around here and a few dining/shopping options once out of the resort so if you are here for a special occasion and don’t want to travel too far from the airport (1.5 hours) it’s a good spot to relax and pamper. I loved this hotel. The second I checked in a monkey stole the sunglasses from the table next to me and I knew I was right in the middle of nature. 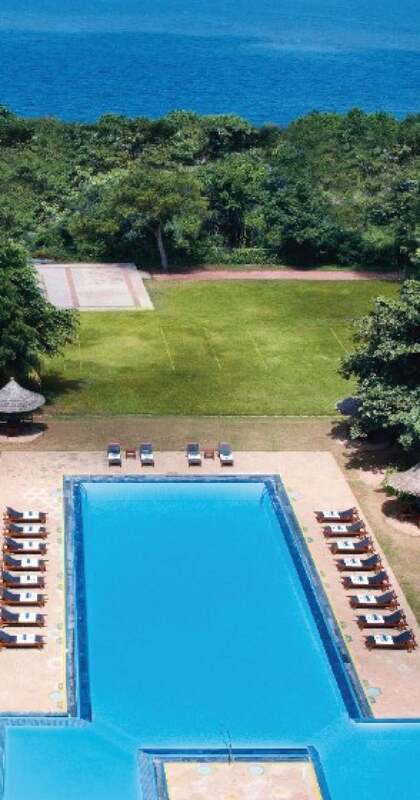 Not only does the pool have that incredible view looking out on Sigiryia rock but being in the heart of plantations and as remote as you are a night time swim, looking up at the clear star lit sky above is pretty special. The rooms are comfy, if not a little basic but the buffet breakfasts and dinners were fantastic and it was the first night I really found Sri Lankan cuisine to be delicious. There isn’t that much hotel choice around the rock itself and I can’t recommend this place highly enough. From Sigiriya it is also a relatively easy busy ride to the Dambulla Cave Temples, one of eight UNESCO listed attractions in Sri Lanka. Ozo is set high up on one of the hills that rise up around Kandy, most famous for the temple of the tooth. It is a surprisingly modern hotel in an otherwise old world city and has a much more hip buzz than anywhere else I stayed in the country. The rooftop pool has epic views looking back down across the city though the pictures make it seem larger than it actually is. When the clouds and mist roll in it makes for a great spot to smoke some shisha in the adjoining bar and watch the cool nights roll in under a heater. Kandy is also the starting point for the incredible slow train from Kandy to Ella. This place is epic. It’s quite a walk out from Ella itself, through tall trees and past lush tea fields and it in fact sits on a huge plantation itself, can you guess how many acres? 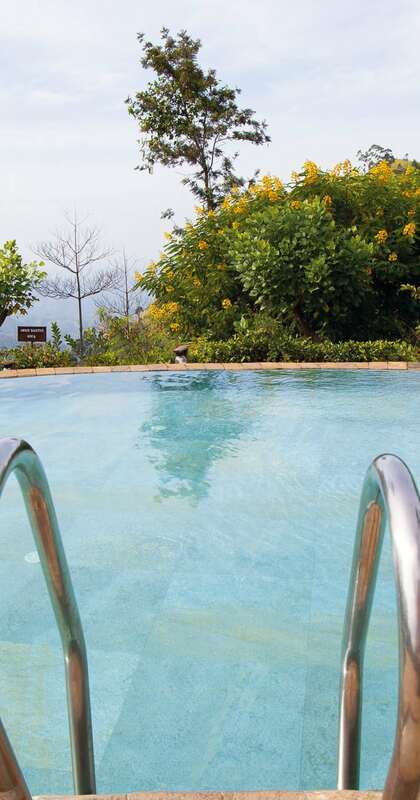 From the pool you can look out at mini Adams peak (header photo on this post) completely surrounded by nature. The bungalows with their straw roofs and dark frames fit into the landscape perfectly and it is almost a retreat more than a resort. Even if you aren’t staying here, swing by the tea house/restaurant which is next to the pool for a quick drink on the way to Little Adams Peak. 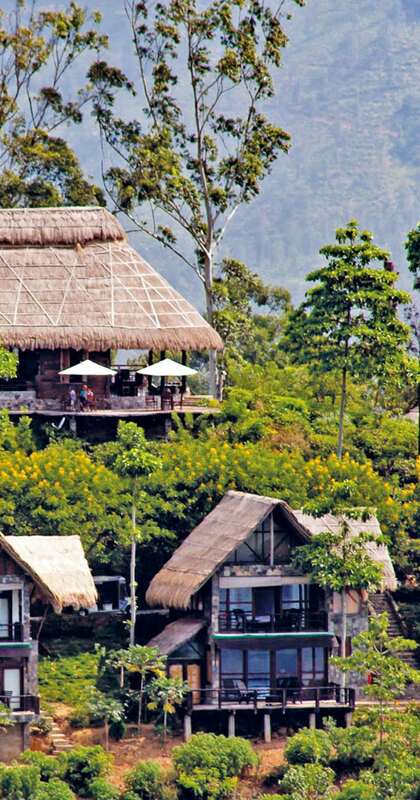 It’s the perfect base to explore the incredible treks and tea plantations around Ella. This hotel was actually a bit of an over-priced disappointment but, if you don’t want to stay in Colombo or Negombo before/after a flight then it is a pretty safe bet near to the airport. To be fair, it was under renovation when I was there with half of the hotel modern and bespoke and half run down and being developed – annoyingly, the part being developed and closed was the ocean facing rooms which made it a little pointless paying more than a small hotel closer to the airport. It does have a great pool which is a short walk from a relaxing lake and gardens and is set in palm trees for as far as the eye can see. Once finished, it will likely be more worth its price point. *Disclosure: This post contains some affiliate links. They do not charge you anything extra to book through but do provide a small commission to keep this website running. 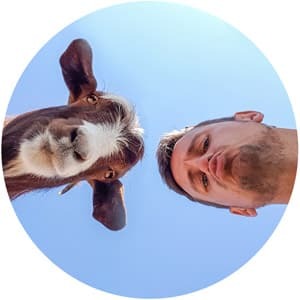 I’m finding your website so helpful so far and I’ve only just started exploring! We are wanting 4-5 nights at the end of our 2 week trip to chill out on a beach in a lovely hotel with a nice pool, good food but with water activities. We think we will be over at Yala NP but we will be flying out of Colombo so I was wondering where would be best to stay location wise and if you have any specific hotel recommendations? I guess max per night would be £150 but hopefully less if we can! Thank you so much, any help is much appreciated! Awesome, glad you have that planned :) Sadly I don’t know any hotels just in that part. Have an amazing time! 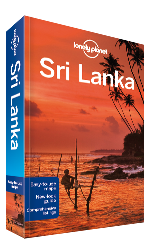 Mesmerizing views, Sri Lanka is so perfect for traveling and exploring. I will add it to my bucket list, thanks for sharing.